Of all the blogs I read daily (58 subscriptions on my Google Reader), I find myself at Bronx Banter most frequently. The commenters there are top-class and always have something insightful to say, and the in-game threads are just the best anywhere (although when the Yankees are losing, it can get rough). One of the most frequent commenters is called "weeping for brunhilde," a man who stands behind the beauty of baseball as he thinks it was meant to be played: with maximum effort and minimum home runs. He's the kind of fan who values the hit and run over the three-run homer, and certainly there's a place in baseball for that. The online tool allows us to easily look at the first two categories, while the third is a bit harder, and we'll take a look on a case-by-case basis. I'll list the caveats up front: 1) Sample Size-- this is data from only one season and while it includes many of A-Rod's at bats, it does not include all of them. In addition, the sample size for individual pitches in individual accounts is absurdly low, and most of the time I've combined categories to make more sound judgments. However, it may just be that the difference between two averages is not significant. 2) Problems with Pitch f/x. This has come up most frequently with pitch location and break, as cameras situated in different parks give different values, and need to be adjusted. The raw data I have access to is not adjusted, but I've tried to avoid most problems by combining all fastball-types (fastball, cutter, sinker) together, and we're not really interested in location just yet. 3) Relative importance- I have a bunch of different calculated values here, and while we can see how A-Rod in a particular split performs versus A-Rod as a whole, we have no idea how the average batter performs in similar situations. So while A-Rod takes the first pitch more often than on other counts, we don't know whether that's true generally, and whether A-Rod takes more or fewer first pitches than other batters. With all that in mind, let's plunge into the data. 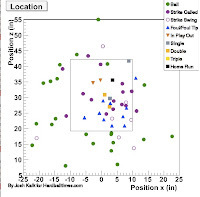 The online tool allows one to drill down by pitch type, count, speed, break, and result of pitch. In this first examination we'll look at the first two. Click here for a spreadsheet that collects every pitch recorded by pitch f/x by count. I've added some calculated values at the end, which I shall explain. I intended the last one to be a bit like Slugging Percentage, except measured by the total bases the player gets for every swing he makes. A-Rod's overall TB/Swing is .305. Interestingly, if you remove foul balls, it goes up to .491. I am open to all suggestions about this stat, but for now I will use it as a description of how successful the player is for a given count or pitch thrown. So let's walk through a typical A-Rod at bat, starting with the first pitch. Everyone says that the first pitch determines everything- the pitcher needs to get that strike one to have control over the at-bat. Well, just under half the time (46.4%), the pitcher gets that first strike, while 40.5% of A-Rod's at bats go to 1-0. The remaining times, he hits the ball in play, and has recorded 21 base hits and 43 outs (.328 BABIP). He is more likely to take a strike on the first pitch (29.9%) than in all counts overall (16.8%), and is much less likely to swing (29.7% versus 45.7% overall). His TB/Swing rate (.345) is elevated over average (.305), thanks to the eight first-pitch home runs, and he's less likely to make an out. 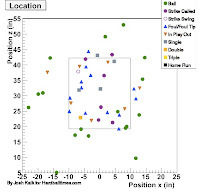 What kinds of pitches are these hitters' throwing? 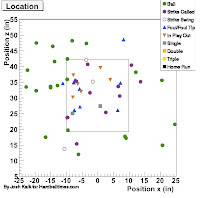 Well, in the 489 at bats Pitch f/x has data for, more than half of them (288) are classified as fastballs. The next highest is the slider at 86, and then the curve at 47 pitches. By the numbers, the worst pitch to throw A-Rod to open the at-bat is the curveball- his .556 TB/Swing is one of his highest for any pitch type in any count. On the other hand, he is very unlikely to swing at the first-pitch curve, just 19.1% of them he's swung at, and has taken 44.7% of them for strikes! Once again, A-Rod is looking for a slider on the outside of the plate, and is more likely to miss if it's down and away; this makes sense on outside sliders from right-handed pitchers. 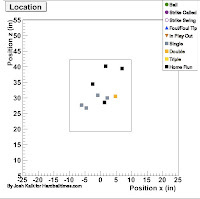 In fact, right handed pitchers are more likely to throw A-Rod a first pitch swing-and miss down and away than any other location, with any type of pitch. Advice: if you're looking for that first-pitch strike, the fastball is still the way to go. A-Rod will take more often than on other counts, but try to get it on the inside part of the plate, where he's less likely to swing. Perhaps in subsequent at bats, if he's keyed into the first-pitch strike, fool him with a slider down and away (righties) or a changeup up and away (lefties). He's not likely to chase a pitch out of the zone, but has done so on those outside sliders. So you, the pitcher, failed to take my advice above and tried to get A-Rod to chase a high heater or inside pitch. What does A-Rod like to see in 1-0 counts? The short answer is almost everything-- with the exception of the ultimate "hitter's count" (3-1), this is A-Rod's best count, TB/Swing-wise, at .372. Number 13 particularly crushes splitters (1.286) and changeups (.571), but quizzically not fastballs (.143). The tables have turned since the first pitch; Rodriguez is much less likely to take a pitch than before (18.1% versus 30.7% first-pitch taking). His foul and out rates seem about average. So what's the deal with that fastball? Two patterns jump right out at me: he's only chased one fastball outside the zone, and most tellingly, pitchers are far more likely to send that 1-0 fastball up and in. While A-Rod rarely chases, if the ball is hittable, A-Rod just doesn't do much with it. 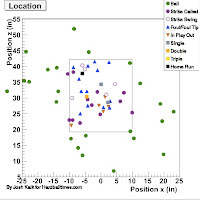 His lone hits on 1-0 fastballs came on pitches that were not elevated. We cannot tell from this data the kinds of outs A-Rod made, but it looks like going right after Rodriguez on 1-0 with some heat is a good idea. In support of the "up and in" strategy is A-Rod's performance on 1-0 sinkers, which are lower in the zone and hit much more frequently. Advice: It is certainly risky to throw off-speed stuff on that 1-0 count: A-Rod has crushed two changeups and two splitters out of the park on this count. All of A-Rod's hits on 1-0 have come on the outside part of the plate... so don't pitch it there. Go with the up and in fastball. Once again, A-Rod almost never chases a bad pitch, but has been victim to the up-and-in fastball, missing a bunch of them and fouling off another bunch. However, he does have an 0-1 fastball homer that was up and in. Rodriguez is most likely to swing at an 0-1 changeup than other types of pitches, and he misses about 50% of the time when he does swing. He does not yet have a hit on an 0-1 curveball or sinker, and will go out of the zone to chase these pitches. Advice: This is a well-known pitcher's pitch. The strategy should be based upon what happened in the opening effort. If it was a fastball on the inside part of the plate, perhaps it's best to try and get A-Rod to chase something off-speed out of the zone. If you ventured to the outside part of the plate or tried a first-pitch breaking ball, then up and in is the place to pitch. Perhaps there has been some varying success with the first two pitches; the count is now even. This is an interesting count for A-Rod. By the rate at which he swings, A-Rod likes his chances with the 1-1 count. The results, however, are just not there, with only .284 TB/Swing, compared to .452 overall. Breaking it down by pitch runs into the first of the sample size issues- though he has faces 70 fastballs on 1-1, every other pitch is at 30 or fewer. At the various kinds of fastballs, A-Rod is extremely likely to swing: 57% on fastballs, 70% on sinkers, 71% on cutters, 73% on splitters. He's had varying success with these pitches, but lumped together it's about average in terms of TB/Swing. We cannot tell from here how well struck those fouls and outs were, but interestingly he has failed to record a hit on the 10 curveballs thrown on this count as well. Speed does not seem to be the issue, as he has faced 24 changeups, recording 3 hits in 13 swings. Advice: Clearly, A-Rod is looking to swing on a 1-1 count. Most of the time he's getting some kind of fastball, and he's had success with that. If a breaking pitch is in your arsenal, consider using it, especially sliders outside the zone from righties. Or, perhaps you tried, unsuccessfully, to get A-Rod to chase fastballs out of the zone on both of the first pitches. The catcher than trotted out to remind you what he read on the Immaculate Inning about A-Rod's pitch selection. No matter- those transgressions will be pass if you buckle down on this hitter's pitch. Surely, A-Rod has his best numbers on the 2-0 count, right? Wrong. His .243 TB/Swing is one of his lowest, far below the .305 average. This isn't for a lack of trying; A-Rod also swings a at a higher rate on this count, he just fouls off a ton of pitches. In 2008, he has just seven hits off of 71 pitches on 2-0, and no home runs. So, the pitchers must be scared of making a mistake in the zone on this count, right? The two strike counts make sense. As we'll see in the next part, A-Rod definitely changes his approach when there's two strikes. But what's the deal with the 2-0 and 3-1 counts, and the high foul percentage? It happens with every pitch type. Do we have evidence of A-Rod "pressing" in the batter's box? Clearly, this is one of the issues that needs further examination, by looking at the league average foul percentage. And so that's where I'm going to stop. There's more than enough information to go wild with, although how significant it is remains to be seen. In the next part, I will look at A-Rod's performance in 3-ball and 2-strike counts. At this point I will solicit any suggestions on how to improve the method and analysis. Clearly, many fans like to heap a bunch of blame on good hitters, calling them "stat-padders" or disparaging their performance in the clutch. Hopefully, with this kind of analysis we can finally take a look at this on a pitch-by-pitch basis. I love reading Nate Silver, but on days where I'm busy at work, reading his number-heavy pieces makes my head hurt. So I just skip to the easy conclusion at the end, and read the guts later. I tried doing that with your post, mehmattski, but it was missing the easy conclusion at the end! So I'm intrigued - but I can't give you any feedback now. Later, I'll see what I've got.